Stitched bonded leather. Holds 5x7 photo. Included glass and velvet backing. Easel back (no hooks for wall hanging). Comes boxed, makes a great gift. 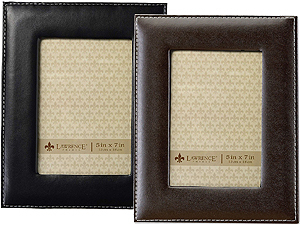 Stitched bonded leather frame with glass front and velvet backing, comes boxed, makes a great gift.